It was equal parts snake, dragon, and ghost. It lived long ago in caves in the Southwest, where it roamed in search of its food of choice: children. Traditional New Mexican lore talks of such a monster, named El Vivaron. And deep in a fossil quarry in northern New Mexico, paleontologists have found a creature fearsome enough to be worthy of its name. Researchers from Virginia Tech said they’ve found the remains of three giant reptiles resembling crocodiles that date back to the very beginning of the age of dinosaurs — more than 212 million years. Based on what they’ve recovered so far — including about a dozen pieces of skull, jaw, and hip bones from three individuals — the paleontologists said that the specimens represent a species that’s new to science: a giant, carnivorous, four-legged reptile that they’ve dubbed Vivaron. Vivaron was likely one of the apex hunters of its time, at the end of the Triassic, shortly after dinosaurs had appeared on the scene, said Dr. Sterling Nesbitt, a Virginia Tech paleontologist who reported the find. “These were some of the biggest predators at the time,” Nesbitt said in a press statement. The three specimens range in size from about 4.2 meters (14 feet) to 5.2 meters (17 feet) long, slightly bigger than the largest crocodiles today. Their bones were found by Nesbitt’s team on the renowned, fossil-rich grounds of Ghost Ranch in northern New Mexico in 2009. But the animals’ significance goes far beyond their putative resemblance to a local legendary monster, the paleontologists said. Rauisuchid fossils have been found in places as diverse as Russia, India, and Brazil, but Vivaron is only the sixth species of rauisuchid to be identified anywhere in the world. Vivaron is the first instance of a new rauisuchid in the region, the researchers reported. Moreover, the New Mexico specimens seem to bear many similarities to another rauisuchid species that’s only been found thousands of kilometers away, in Germany. 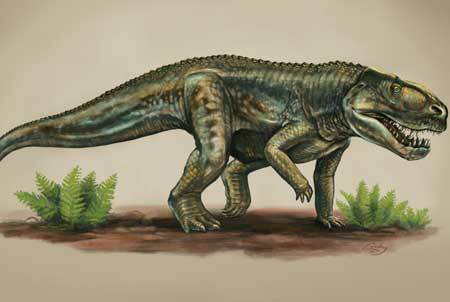 Features of its upper jaw and teeth share many qualities with Germany’s croc-like Teratosaurus. This suggests a close evolutionary relationship between the Southwestern and European reptiles, the team noted — a distinct possibility, considering that the landforms at the time were joined together as the supercontinent known as Pangea. 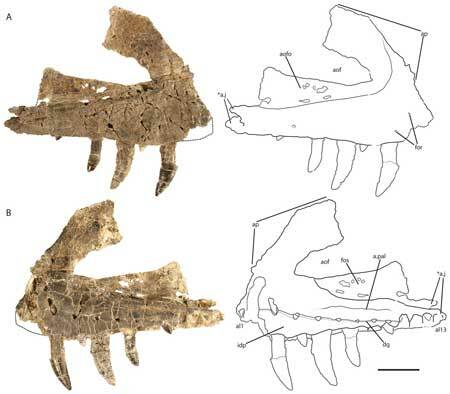 So Vivaron is not only proof that the reptile predators of the Southwest were more diverse than were once thought; it also suggests that closely-related rauisuchids were much more widespread than experts believed. 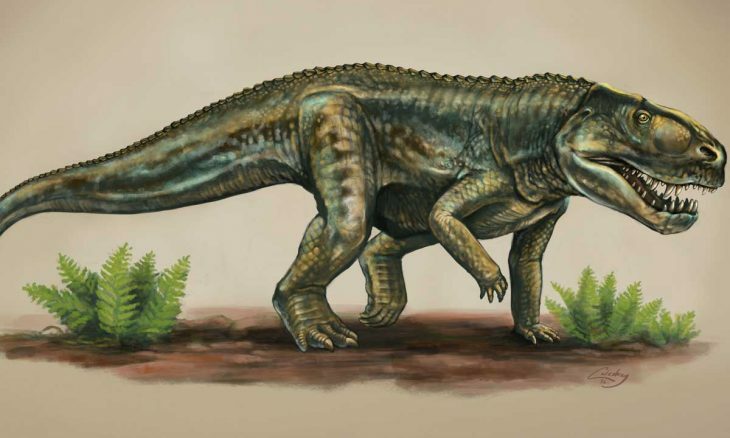 “Previously, despite spanning over a thousand kilometers of geographic distance and over 10 million years of time, nearly all southwestern United States rauisuchid [fossils] were assigned to a single species, Postosuchus kirkpatricki,” the team wrote in their paper reporting the find. There’s much that remains to be learned about these ancient reptilian predators, the team pointed out. “It is possible that other bones were not preserved, were previously collected, or are still in the ground,” said Emily Lessner, a Virginia Tech undergraduate who participated in the research, in the press statement. Nesbitt, Lessner, and their colleagues report their findings in the journal PeerJ.